The thought of shots and needles makes many people cringe and in some cases avoid getting important vaccinations. 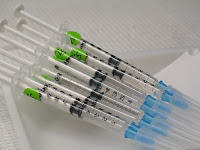 Most vaccines are administered intramuscularly, as this optimizes the immunogenicity of the vaccine and minimizes adverse reactions at the site of injection. Researchers have recently studied the efficiency of intradermal (ID) vaccination compared to intramuscular (IM) vaccination against seasonal influenza. The ID method uses a narrow 1.5 mm needle which is inserted perpendicularly into the skin, delivering the drug into the upper layers of the skin rather than into deeper tissues beneath the skin or muscle. Since skin acts as an immunological barrier and is home to professional antigen-presenting cells such as dermal dendritic cells (see March 18, 2009 post) and Langerhans cells, ID vaccination delivers antigen directly to immune cells. By testing different amounts of the vaccine delivered either ID or IM, a dose was determined where ID vaccination was statistically non-inferior to IM vaccination and showed comparable immunogenic and safety profiles. Although ID injection resulted in increased local inflammation and redness, this study validates the use of ID vaccination and may prove to be a good alternative for those who dislike IM injections. Reference: Beran J, Ambrozaitis A, Laiskonis A, Mickuviene N, Bacart P, Calozet Y, Demanet E, Heijmans S, Van Belle P, Weber F, Salamand C. (2009) Intradermal influenza vaccination of healthy adults using a new microinjection system: a 3-year randomised controlled safety and immunogenicity trial. BMC Medicine 7(1):13.